Thomas Starzl, Trailblazer In Organ Transplantation, Dies At 90 : The Two-Way The doctor, who performed the world's first liver transplant surgery in 1963, eventually earned the moniker "father of transplantation." In this 1989 photograph, Thomas Starzl oversees a liver transplant operation at the University of Pittsburgh Medical Center. Starzl won a National Medal of Science in 2004. 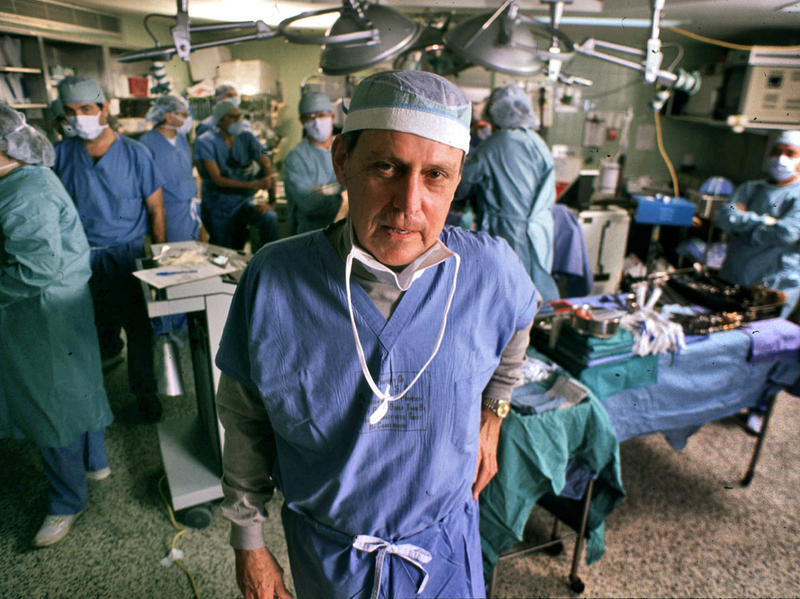 Thomas Starzl, the doctor who pioneered liver transplant surgery, has died at the age of 90. In an announcement on its website, the University of Pittsburgh Medical Center said Starzl died peacefully at his home on Saturday. "His work in neuroscience, metabolism, transplantation and immunology has brought life and hope to countless patients, and his teaching in these areas has spread that capacity for good to countless practitioners and researchers everywhere," his family wrote in a statement issued Sunday by UPMC and the University of Pittsburgh. "With determination and irresistible resolve, Thomas Starzl advanced medicine through his intuition and uncanny insight into both the technical and human aspects of even the most challenging problems." By the time he died, Starzl widely enjoyed a towering reputation in the medical profession — but this was not always the case. The doctor, who eventually became known as the "father of transplantation," drew his fair share of criticism when he began experimenting with transplants. "Transplanting was hardly even thought of as a possibility then," Starzl once said. "I was working blind." In 1963, Starzl led the team of surgeons that performed the world's first liver transplant. The patient, a child who had been born with half a liver, did not survive that operation due to excessive blood loss. Undeterred, Starzl attempted the operation again just two months later on another patient who suffered from liver cancer. This time, it appeared to be a success — until the man died three weeks afterward, this time from blood clotting. Still, Starzl kept working, also researching drugs to block the human immune system from rejecting its newly implanted organ. And by the late 1970s, the survival rate for patients undergoing liver transplantation had risen to roughly 40 percent. When in the early '80s he left the University of Colorado for the University of Pittsburgh, where we would go on to spend more than three decades, Starzl and his surgical team had already transplanted more than 1,000 livers. Under his leadership, UPMC would go on to become one of the world's foremost transplant centers. During his time there, he became known as a prolific publisher. In fact, as UPMC notes, the Institute for Scientific Information identified Starzl in 1999 as "the most cited scientist in the field of clinical medicine." The ISI estimated that for a time he was averaging the publication of one paper every 7.3 days, according to UPMC. For his achievements, the school renamed its transplant institute after Starzl in 1996. By that point, however, Starzl had retired from performing surgery. Following his own coronary bypass surgery in 1990, he decided it was time to give up the scalpel — much to his personal relief, as it turns out. "I was not emotionally equipped to be a surgeon or to deal with its brutality," Starzl acknowledged in his 1992 memoir, The Puzzle People. Despite Starzl's achievements at the operating table, his family says he should perhaps be best remembered as a teacher and a friend. "Even more extraordinary [than his medical advances] was his ability to gift that capacity to those around him, allowing his students and colleagues to discover the right stuff within themselves," the family said in its statement. "Nobody who spent time with Thomas Starzl could remain unaffected."